“Weird Al” Yankovic is a national treasure. For over 30 years, he’s made humorous parodies of pop hits. From Michael Jackson to Nirvana to Lady Gaga, Weird Al’s career has changed with the times. 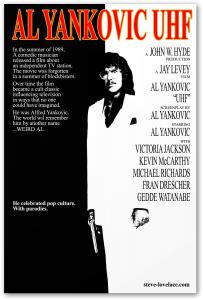 But while he’s had an enduring music career, Weird Al also made a movie. His 1989 film, “UHF”, followed a man who inherited a struggling TV station, bringing it to profitability with such hits as “Bowling for Burgers”, “Conan the Librarian”, “Underwater Bingo for Teens” and “The Volcano Worshippers’ Hour”. It was bizarre stuff back in ’89, but modern entertainment seems to have caught up, featuring more low-budget unscripted TV shows. For better or worse, I see a Weird Al influence on modern TV, enough that I can argue that “Weird Al” Yankovic invented reality TV. Television in 1989 was dominated by traditional multi-camera sitcoms and scripted dramas. Most of the culturally significant programming came from ABC, CBS or NBC. (Fox was also making inroads; “The Simpsons” debuted that year.) Cable television and smaller TV stations played mostly reruns. But on Weird Al’s UHF station, programming is unscripted and low-budget. His biggest hit, “Stanley Spadowski’s Clubhouse”, is just a half-wit janitor (a pre-Seinfeld Michael Richards) goofing off in front of a camera. In this regard, Richards’ character presaged modern reality stars who become famous just for playing slightly exaggerated versions of themselves. Another reality show aspect was the mean streak running through the programs. On the game show “Wheel of Fish”, a contestant has to choose between a red snapper and a mystery box. When the box she chooses turns out to be empty, the host (Gedde Watanabe) berates her. “Stupid! You’re so stupid”. This was a decade before Simon Cowell started crushing contestants on “American Idol”. It stood out in an era when contestants won consolation prizes, but nowadays, it wouldn’t raise an eyebrow on cable TV. 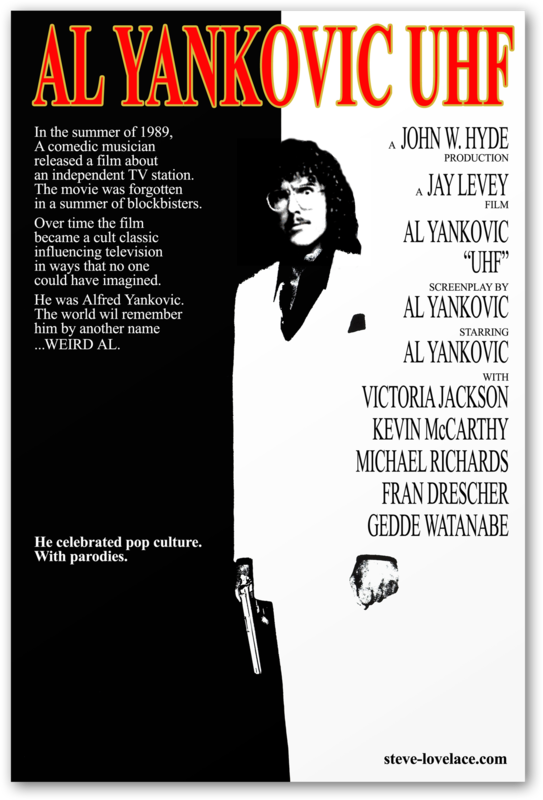 Of course, “Weird Al” Yankovic didn’t set out to invent reality TV. He simply made a movie with his own bizarre TV parodies. But by making the movie about a low-budget TV station, he showed us what television would look like after the fall of the Big Three networks. In that regard, Weird Al was spot-on. Previous story Who’s Afraid of Big Government?